Beth Dooley: FARMERS OF TASTE! There's a soft plunk when the first blueberries hit the cardboard basket that Matt, Blue Vista's manager, Matt, hands me before I headed off into that lush wild blue yonder. The fields vary by berry -- some tall as my shoulders heavy with fat, dusty colored berries that are mellow and perfumy, then there are the lower bushes with tiny, purply intensely sweet tart gems. And who knows how long it takes me to fill the box to its brim for, always, I'm lost in time, amid buzzing bees, clouds lolling over the sun. One berry leads to the next and the next with endless bounty. 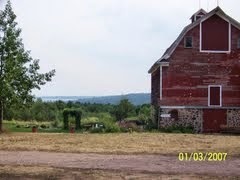 This farm's handsome weathered barn overlooks exquisite gardens of old fashioned favorites (gorgeous foxglove), butterflies feast and humming birds hover. You can see a corner of the lake over the old-growth trees. Once we've weighed in and checked out, it's not hard for my sons and I to polish off several pints as we drive away, but pretty soon, hate to admit it, we grow a bit weary of these berry treasures. So we jam. blueberry jam, any jam, really, is perhaps the easiest preserve to put up. There's enough liquid in the berries that I just let them cook away until they're a lovely thick mash of their rich, summery selves. A splash of lemon or lime juice, a little ginger, a dash of vanilla or black pepper. That's it. Put the berries, lemon or lime juice, and ginger (if using) into a large pot. Crush the berries slightly with the back of a spoon and set over medium-high heat. Bring to a boil, reduce the heat, and stir as the berries release their juices. Stir in the sugar to taste and simmer until the jam has reduced to your liking, about 30 minutes to 1 hour. Spoon into clean jars. Allow to cool, then cover and store in the refrigerator for up to 1 month or freeze.